The Present... - EXMOOR 1820 ... THE YEAR OF CHANGE. ​An extensive collection of family papers have been discovered in the possession of one of the family descendants by marriage in Worcestershire. Most of the papers relate to the improvements of Exmoor and shed detailed light on John Knight’s great Exmoor project. Bob Walters who is a photographer and ENPA volunteer presented a slideshow of a selection of the images that he has taken. Bob has begun photographing aspects of Ashcombe and White Rock Cottage on a regular basis with the object of documenting the changes that take place due to the project, but also in order to capture the essence of the place. Benjamin & Beauchamp Architects had been taken on as Project Managers for the building work. A start-up meeting has taken place and building work is planned to commence in April. Further advice from ENPA planning officers has resulted in a full application, going forward to the Planning Committee. It will be considered on 2nd April. An amendment to the Natural England bat licence is being considered by NE and should be determined on 22 March. Cyril Harriss, a highly experienced conservation builder, has been busy repairing the Gardeners’ Store: the front elevation and arch has been repaired and a new roof is being made. This work is funded by Caremoor and is due to be completed before the main building work on White Rock Cottage commences in order to provide bat habitat on site. 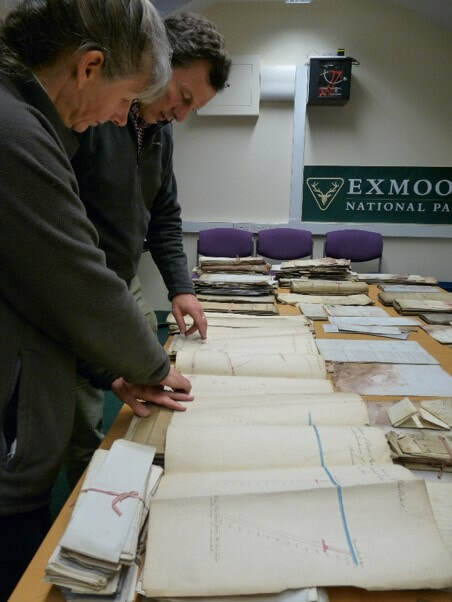 Paperwork about the Simonsbath and Exmoor Heritage Trust was distributed to those who have put their names forward to be trustees. The Draft Restoration Plan had been circulated to the Group previously and it was discussed. On 4th March around 20 volunteers began work on the planting schemes in Ashcombe: so far 2000 snowdrops have been planted, a stand of Scots Pine around one of the outcrops halfway up the Ashcombe valley, swamp cypress in a wet area in the valley bottom; as well, purple willow, Portugese laurel, English yew and box have also been planted. Volunteers have also begun working on site management – they will meet monthly from now on, on the first Monday. A volunteer work plan is being developed. A report on the 4th March was read out to the group, and this will be added to an Ashcombe Journal which will document our progress. ​Posters about the Simonsbath Sprintime coffee morning event in St Luke’s Church on Saturday 6th April (10am to noon) were given to all in the meeting. The SSG met at the Simonsbath House Hotel and the following points were raised. Rob Wilson-North reported that the funding was now in place to begin the building work at White Rock Cottage and the former Simonsbath School. Work is planned to begin in March 2019. He also reported that the plan to begin work on restoring the adjacent Ashcombe Gardens will be starting in the spring with several volunteers already signed up and raring to go. The chairman of the SSG, Mr Steven Pugsley, produced the draft Trust Document and all members who were present were very happy for this to be accepted as the official Trust Document. It was then asked by members who would like to be a trustee and several members put their names forward. This is a very exciting next stage in the development of the original plan which is to preserve and promote the understanding and appreciation of the history, heritage, culture and traditions of Simonsbath and Exmoor parish. Following on from the success of the Simonsbath Sparkle, there are plans to hold a spring event in St Luke’s Church, Simonsbath, so watch this space as details will follow. November 2018 Simonsbath Steering Group. What a wonderful evening the Simonsbath Sparkle was on Saturday 10th November. The weather reports kept changing through the week and they even predicted thunder and lightning at one point, but thankfully from 4pm onwards it was dry and it ended up being a clear night so we could even see the stars! Ashcombe was a glow with night lights and lanterns and Simonsbath really did sparkle, especially when everyone lit their sparklers! Lorna Vigars kindly supplied the food which was a great success and members of the Simonsbath Steering Group and Exmoor Parish Council created the wonderful fire that certainly kept us all warm. The main reason for the event was to get the community of Simonsbath and Exmoor Parish together and it did. It was so lovely to see so many local people enjoying the food and fire and chatting and laughing together. Thanks go to ENPA for allowing us to have the bonfire at Ashcombe and we hope it will become a regular yearly event. We will be organising other events for the Simonsbath and Exmoor Parish community next year, so watch this space. We are also looking for people to help with the gardens at Ashcombe, so if you think you might be interested and want to know more please get in touch. The Simonsbath Trust is beginning to take shape and so if anyone would like to know more about how they can get involved with this fantastic project for Simonsbath and the Parish of Exmoor then again, please do get in touch. The Simonsbath Steering Group met at Simonsbath House Hotel and the following points were raised. Rob Wilson-North (RWN) spoke about his recent trip to Hafod in Wales, a massive estate created by John Knight’s cousin. Simonsbath and Hafod bear several comparisons and RWN said it was helpful to meet a trustee and also church members who were passionate about their project. It was agreed that if a Simonsbath Trust is created it should seek to establish long term links with Hafod. There was a discussion about how to move to Trust status and RWN updated the group with the intentions for the Ashcombe gardens this winter. The Simonsbath Sparkle was discussed and a date of 10th November proposed as an evening to hold a bonfire and burger social open to anyone who wished to attend. See advert for full details. Many thanks to Simonsbath House Hotel for the use of their room for the meeting and the chocolate brownies are always a delight. A meeting was held at the Simonsbath House Hotel to discuss the proposed Simonsbath Trust and the Trust Deed. A report on the recent Ashcombe Garden excavation was given which discovered a path from the original 1820 garden in the main meadow area and a wall and path below the leat. An outdoor social event was proposed to be held in Simonsbath to celebrate the Autumn Season. Watch this space, details to follow in the October edition of Across Exmoor for the ‘Simonsbath Sparkle’. On Friday 8th September 2017 White Rock Cottage was open for the public to walk around under the Heritage Open Day Scheme. Representatives of the ENPA and the Steering group were there to meet and greet visitors and to explain the past, present and future of the buildings. People came from far and wide to find out what was happening and all who came were fascinated by the story of the Knights and also the possible developments of White Rock Cottage, the school and the lost gardens. We were told stories of school days by relatives of past pupils and even though it started as a damp Exmoor morning the sun came out in the afternoon and many people were able to see around the usually locked up and secure old buildings.